The Prasanna Group was established by Shri Keshav Waman Patwardhan.Shri Prasanna Patwardhan, the current Chairman & Managing Director, has been instrumental in not only consolidating the group activities, but also taking the group to the higher levels by achieving a mammoth growth in various segments of Mobility Solutions. He inherited 1 bus & 4 cars which, under his visionary leadership expanded to 1200+ buses. Such exponential growth has been accomplished through his far-sighted business acumen and the respect that he commands within the business fraternity. Prasanna Purple offers an array of mobility solutions like City and Intercity buses, Bus and Car rentals, Employee Mobility and school bus services, Hop On Hop Off city sight-seeing services, corporate MICE movement, customized Individual and group tours. We have a vast experience of more than 30 years. Today, we operate around 1200+ vehicles of different categories. We carry more than 240 Million Passengers by our city buses and 1.5 million passengers on intercity buses per annum. We maintain a very high level of service standards and to achieve this we train our staff with various profiles for at least 52 hours per year. We are very sensitive to environment, health and safety related issues and these issues are always a priority in Purple’s Business Agenda. Purple has become a member of Global Passenger Network (GPN) in 2016, the first company in India to be a member of this prestigious organization. We have an array of mobility solutions like City and Intercity buses, Bus and Car rentals, Employee Mobility and school bus services, Hop on Hop off city sight-seeing services, Corporate MICE movement, Individual and group tours. We understand the concept of human logistics very well due to our vast experience of 25 years. Today we operate around 1200+ vehicles of different categories. We carry 240 Million Passengers by our city buses and 1.5 million passengers on intercity buses per annum. We maintain very high level of service standards; to achieve this we train our staff from all categories at least 52 hours per year. We are very sensitive to environment, health and safety related issues and we practice it as priority. 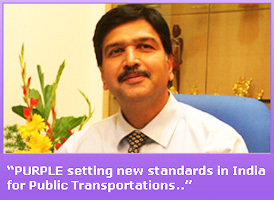 Purple has become a member of Global Passenger Network (GPN) in 2016, the first company in India to be a member of this prestigious organisation. 2015: Employee Mobility Solutions - 1200+ buses, Acquired TVS Commutation Services, Chennai with 192 buses. Operates as city public transport by providing Metro feeder services, BRTS & City Bus Network services at Delhi, Surat, Indore, Bhopal & Pune on PPP model in collaboration with Urban Local Bodies. We are the only operator in India to operate Hop on Hop off sightseeing service at Delhi & Goa in alliance with State Tourism departments. We offer Air ticketing services along with great holiday packages to individual, families (FIT) and groups (GIT) in India & Abroad. We custom build tours to suite each individual taste, plus we offer Passport, Visa & Forex assistance. Planning, Conceiving & Developing customized large format experiential tours & holiday which also includes destination wedding at exotic places. We operate Super Luxury air-conditioned daily services with seaters, semi-sleepers & sleeper coaches across Maharashtra & neighbouring states. Short distance tours by luxury coach which includes tours to beaches, hill stations, forts, and pilgrimages & wildlife. It is our constant endeavour to provide technology based Complete Student transportation solutions combined with many safety features. We are a proud member of Global Passenger Network – Represents a global network of best coach service operators ensuring highest standards of Safety and Quality. Customer Smart Cards(RFID – Radio frequency identification) Avoid cash transaction to prevent malpractice. Easy for commuters to carry the card. To keep a better control on fleet position, speed and stoppages. To collect the maximum possible data and generate MIS reports. Finance Finance Systems – Tally ERP To bring central control on accounting and financial procedures.